Now these are the ultimate tree houses. Living trees are guided into the shapes of towers, cathedrals, and pavilions, creating wooden structures that continue to grow and bud and bloom. Vegetal Cathedral (La Cattedrale Vegetale), designed by Guiliano Mauri, grounded in 2001, completed in 2010, in the woods of the Sella Valley, Trentino, North Italy. It stands on an area of 7,000 sq ft (650 sqm) and 16-70 ft (4.9 to 21.3 m) high. Another Weidendom, Schlepzig, Germany, designed by Marcel Kalberer, built in 2004. After the trees grew for a few years, the support structure could be removed. The first tower made entirely out of living trees (white willow) with the Botany Building system mentioned above, built in 2009. The support structure will be taken down after 8-10 years, if the willow could hold all three zinc-coated platforms. The Patient Gardener, a two-story retreat consisting of ten Japanese cherry trees, created by visiondivision, Politecnico di Milano, Milan, Italy, 2011. The final result can be enjoyed around 2090. 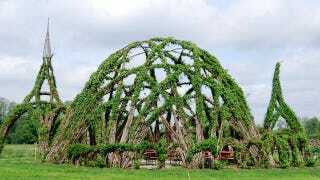 Bonus: The Green Cathedral, a land art project of 178 Lombardy poplars mimics the shape and size of the Cathedral of Notre-Dame, Reims, France, located near Almere, The Netherlands, planted by Marinus Boezem in April 1987.